Less than a week to Halloween peeps! Halloween treats have been showing up across the interwebs since the beginning of September (or earlier!) so I figured I'd add some colorful skull cake bites to the mix. I do have to admit that although I love cake bites and cake pops, I loathe dipping them in melted candy wafers or chocolate. 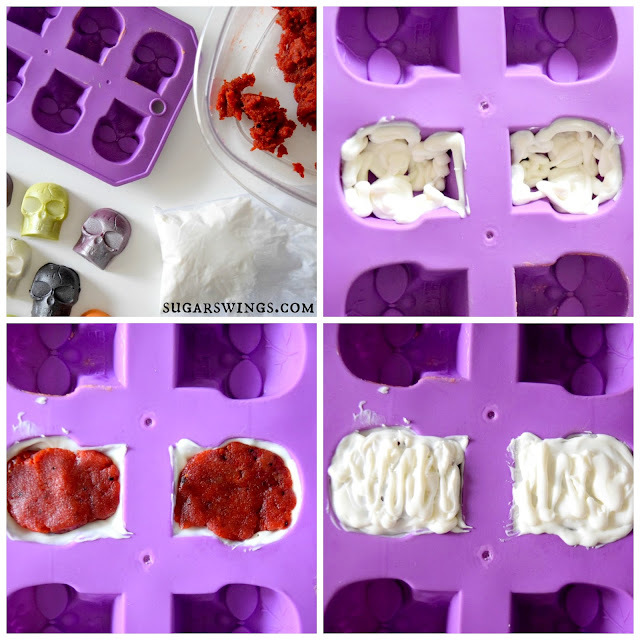 Use a candy mold (or in this case a dollar store ice cube tray) in whatever form or shape you like. Mix up your cake and icing like you would for regular cake bites but instead of dipping the cake mixture into melted candy - melt the candy and outline the mold. Once it hardens add your cake mixture to the cavity, then add more melted candy to cover it. Refrigerate (or freeze) for 10 minutes then pop out of the mold. Voila! No dip cake bites! I sprayed my cake bite skulls with some pearl color mist in pearl to give the cake bites a shimmery shine. This is my favorite stuff of all times (and I don't even get any free product from Wilton!). 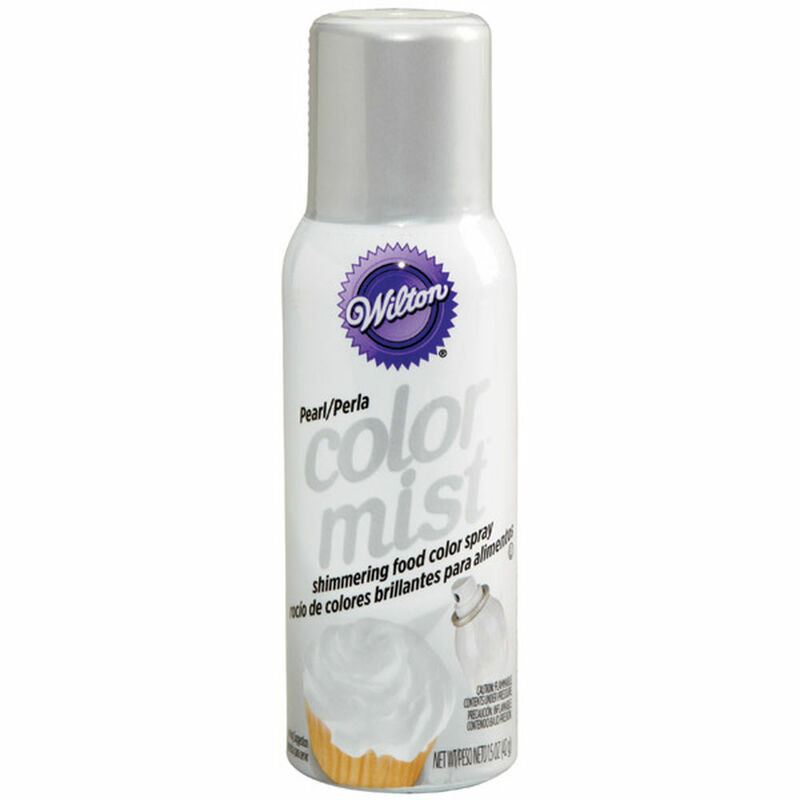 Wilton makes it in many colors and it's a quick way to color your treats - like edible spray paint. 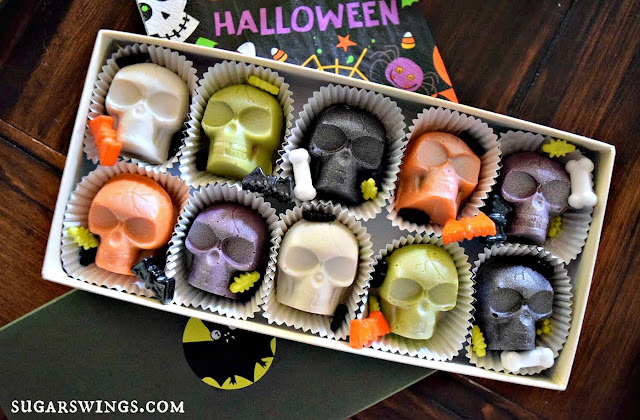 And of course the cake inside makes these little skulls so tasty. I tinted the cake mixture red because they are little skulls and well, it's Halloween! 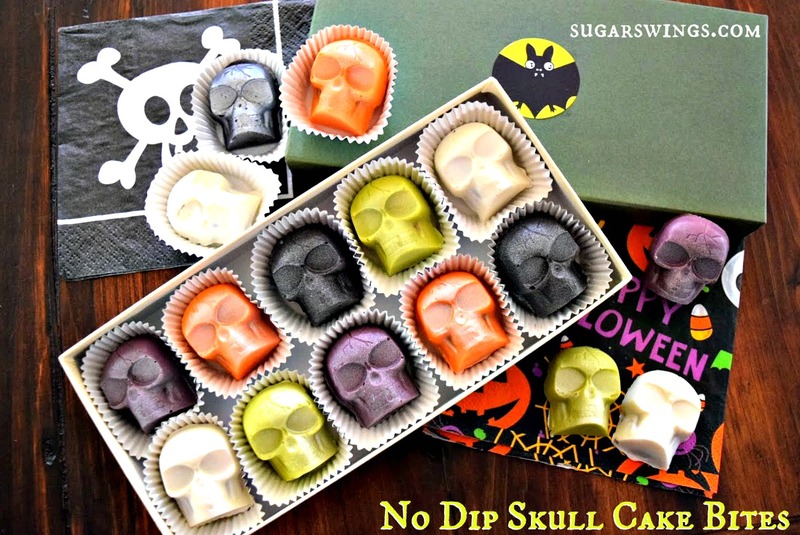 I have like a gagillion candy molds and ice cube trays so I'm going to have to use this technique for more cake bites. It could be tricky making cake pops - but depending on the mold it could work too or you can add a little more melted candy to the back of the cake bite to attach a stick. These little guys are a Halloween gift for a special friend. How cute are they in a re-purposed little box?! Add Halloween stickers and some spooky candies and you have a gift that's way better than any store-bought candy box. 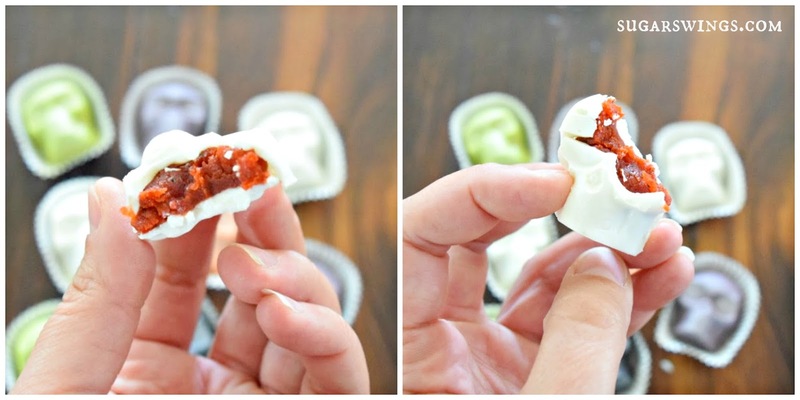 Since the cake bites are easy to put together (and no dipping needed!) make a bunch for your friends or this year's Halloween party! Mix cake crumbles with frosting and 2-3 drops of red food gel until well mixed. Set aside. 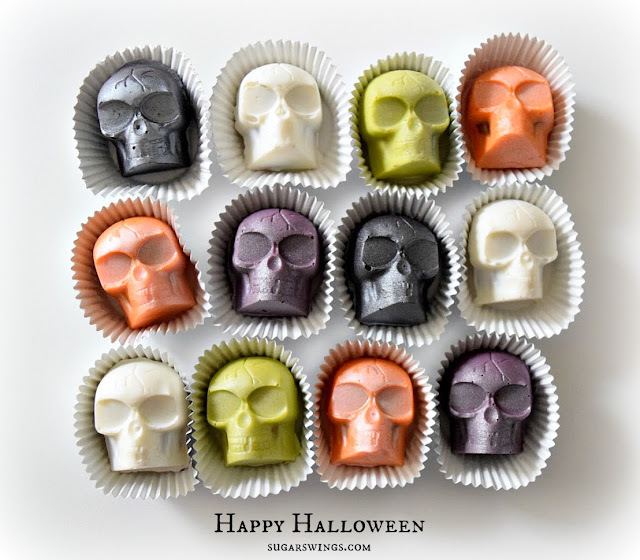 Melt each color of candy wafer in microwave safe bowl in 10-20 second intervals until candy is melted. Add to quart sized freezer bag. 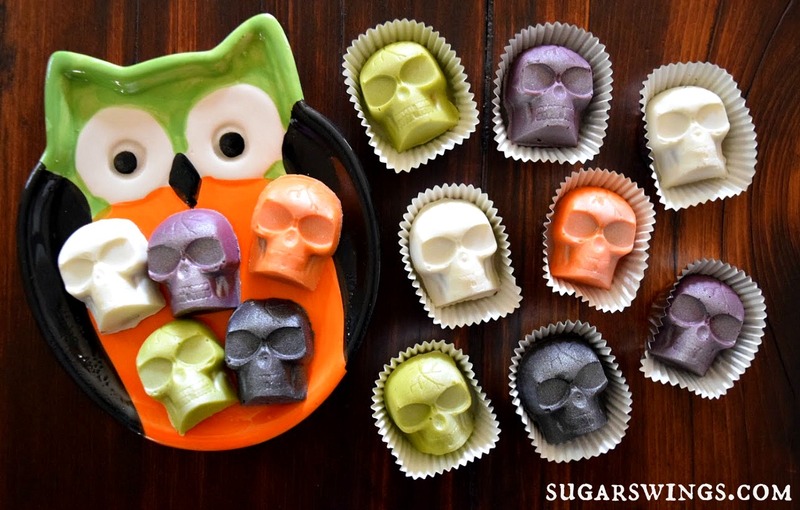 Snip an end and coat skull mold with candy (ensure thick enough to coat all sides of mold but leave a space to allow for filling). Tap mold to remove air bubbles and to make sure all parts of mold are coated well. Reheat candy as needed. Freeze mold for 5 minutes. Remove mold from freezer and fill cavities with small ball of the cake mixture. Press to cake fills mold cavity (see photos). Cover with more melted candy. Tap to cover evenly. Freeze for 10-15 minutes. Pop cake bite out of mold. Spray with color mist. Let dry 10 minutes. I'm gonna have to buy some color mist! This is the second recipe I've seen this month that uses it, and I can't get over how cool it makes things look! How cool! I love your skulls! And all the different colors are great. Thanks Erin!! I love all the colors candy melts come in now and love that color spray! !